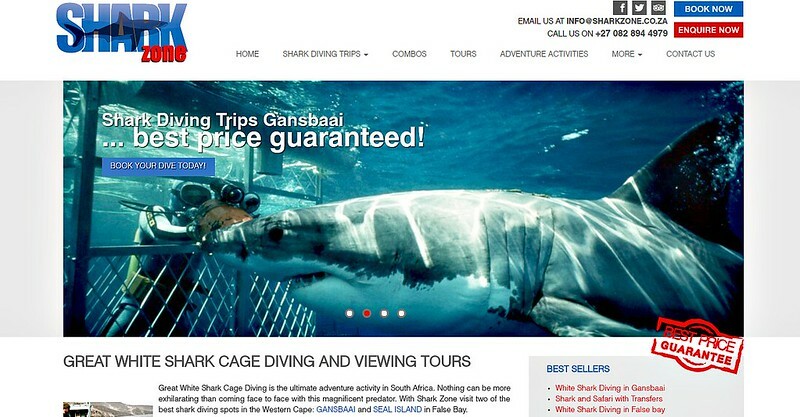 The company I chose to dive with was Shark Zone, in the town of South Africa called Gansbaai, located 2.5 hours from Cape Town. 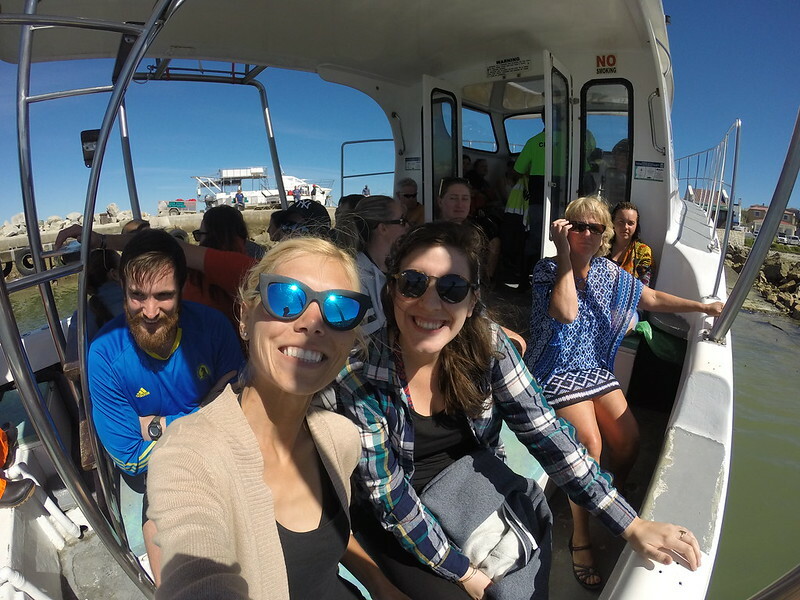 There is channel of water near Gansbaai called Shark Alley, which is situated between two islands, home to over 50,000 Cape fur seals. This makes for the perfect home base for these sharks, as they have an ample and consistent food source. In fact, Shark Alley is the world’s top spot for great white shark sightings, with the highest population of great whites year-round. Fun fact: There are currently ZERO great whites in captivity. They have migratory behavior, which makes putting them in a confined tank an incredibly stressful experience. 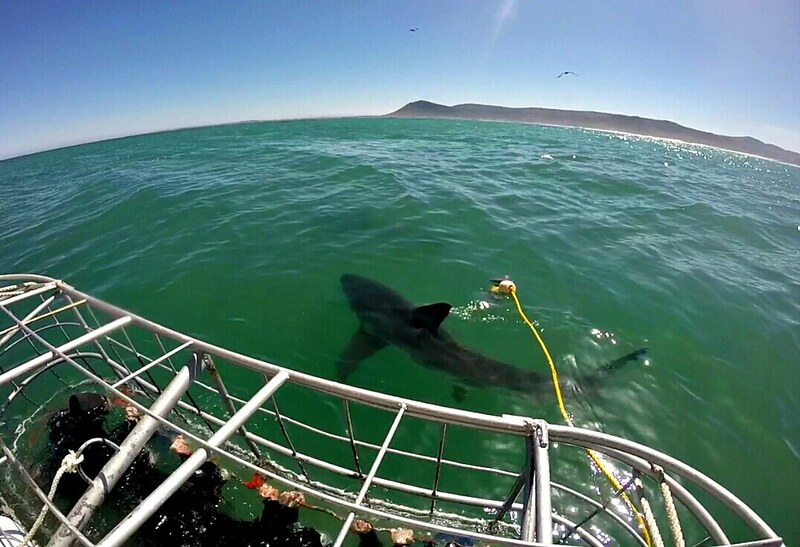 For this reason, shark cage diving is the only way to see these massive creatures up-close. 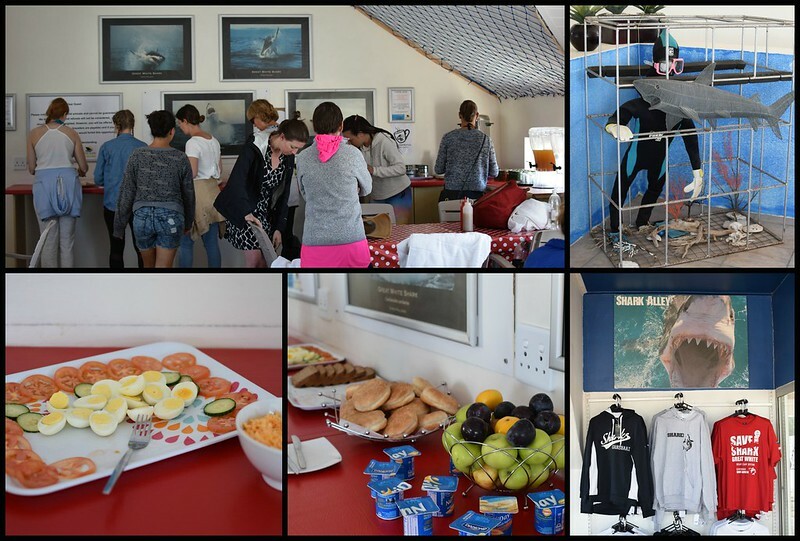 Now for cage diving, I was picked up around 8AM in Cape Town, and transported to the town of Gansbaai, where my group enjoyed a light breakfast, and a briefing on the shark dive. 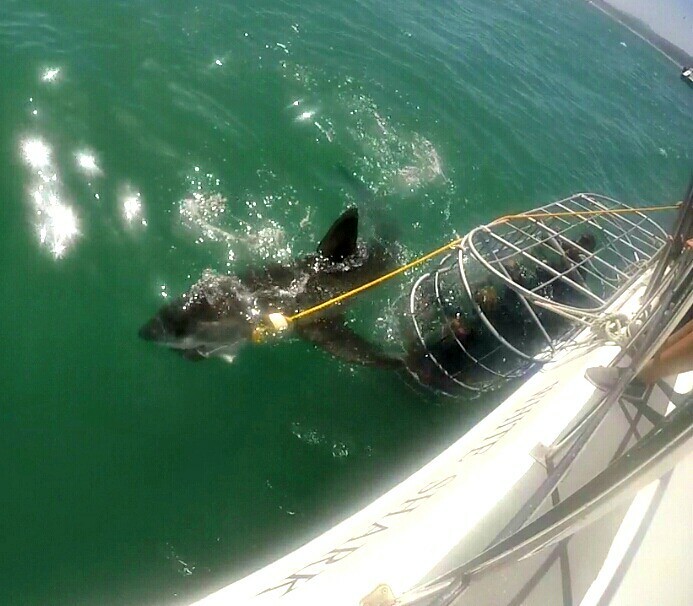 Now, with the wet suit we remain buoyant on the top of the water, which is perfect for these surface-feeding sharks. 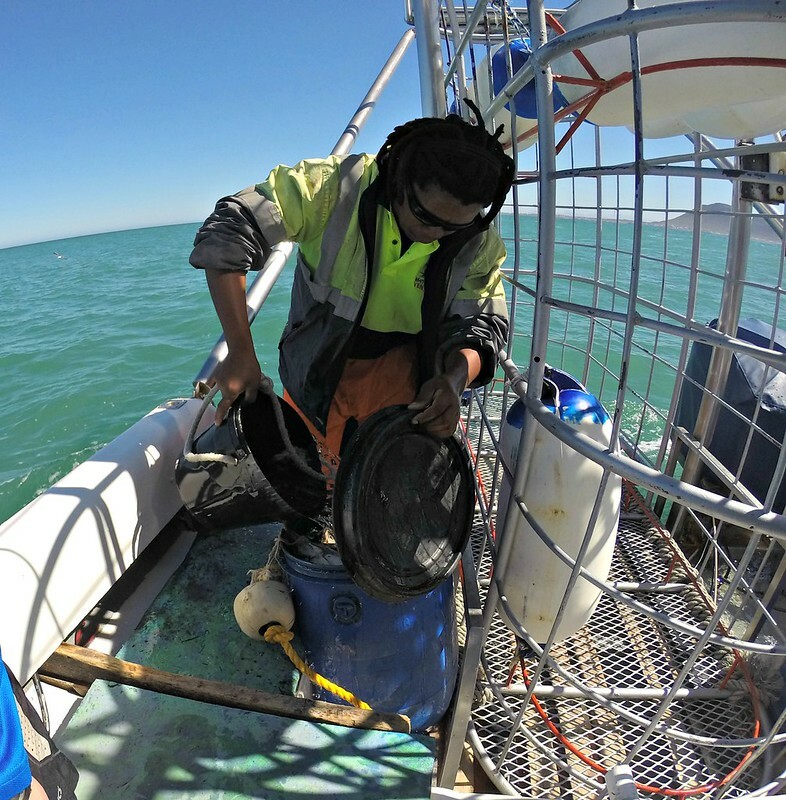 The crew basically attracts the sharks by chumming the water with hunks of oily tuna. Now when it was my turn to dive, I was given a set of goggles, and told to slide my body into the cage. Of course things started off on an interesting note, since as I was getting into the cage, a chunk of tuna was being dragged in front of us and a great white came smashing into the cage bars, jaws fully open! I knew this was going to be one heck of a ride! Anyway, when I finally got in, one of the first things I noticed was not only how frickin’ freezing the water was, but also how much my body was bobbing around the cage. I had to maintain a death hold on that inner RED bar, just to make sure all my appendages stayed intact. 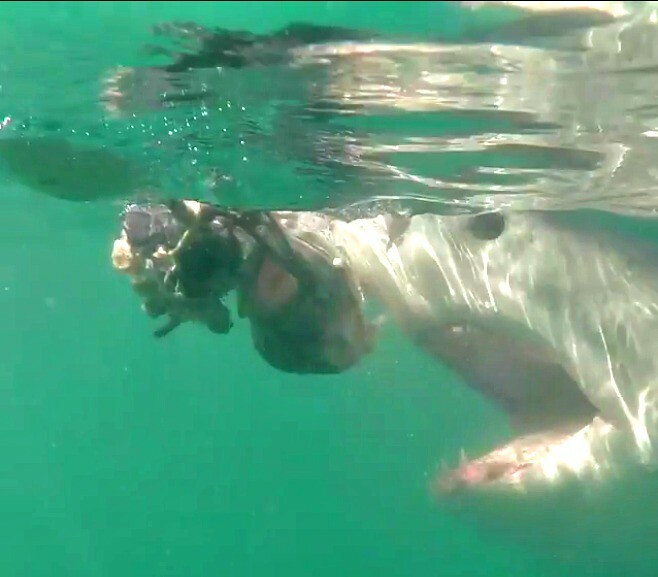 As well, the visibility under the water was not the greatest, and I found the best viewing to be from the surface of the water, where I could see the shark’s massive body coming towards me. Fun fact: Great white sharks are highly intelligent creatures, since they have to hunt dolphins and seals, which also operate on a higher level of thinking. 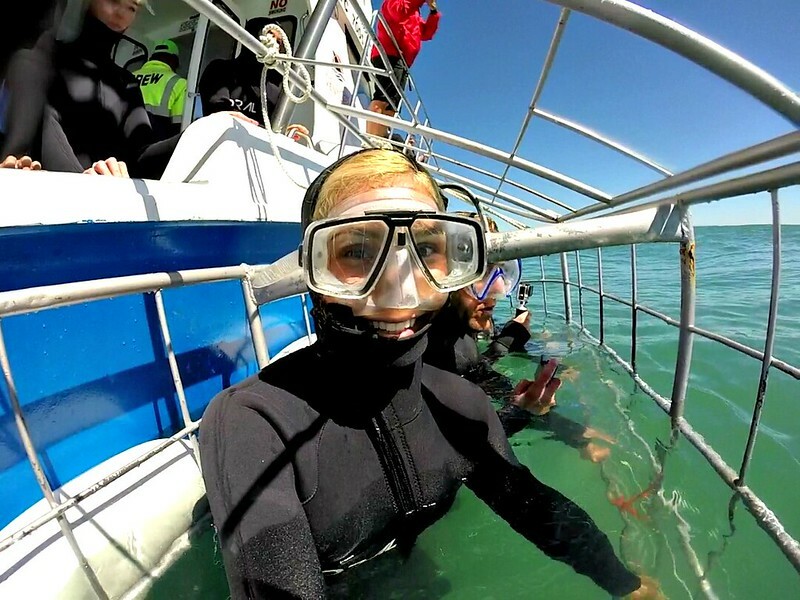 Our guide mentioned that if you think one of the sharks is looking you in the eye, that’s because it is! They are analyzing you and scooping you out, and the only way they can really investigate something is by feeling it with its teeth! 😮 That being said, humans are actually a greater threat to sharks. In fact, up to 100 million sharks are killed each year by fisherman, and there are less than 10 fatal shark attacks each year. Fun fact: Humans are definitely not a shark’s preferred prey, and 70% of their diet actually comes from eating other sharks. 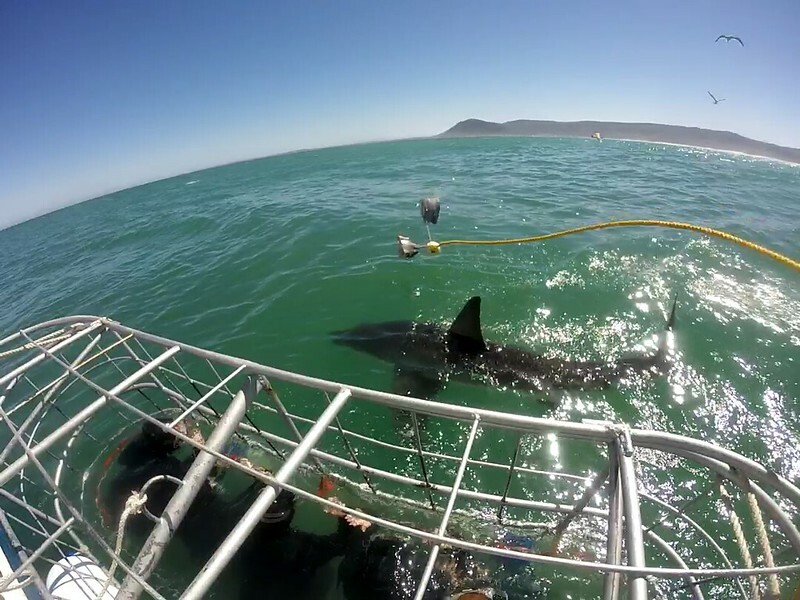 Overall, we ended up seeing 8 great white sharks that day. One of the coolest things for me was watching the shark’s varied hunting tactics for getting the hunks of tuna. 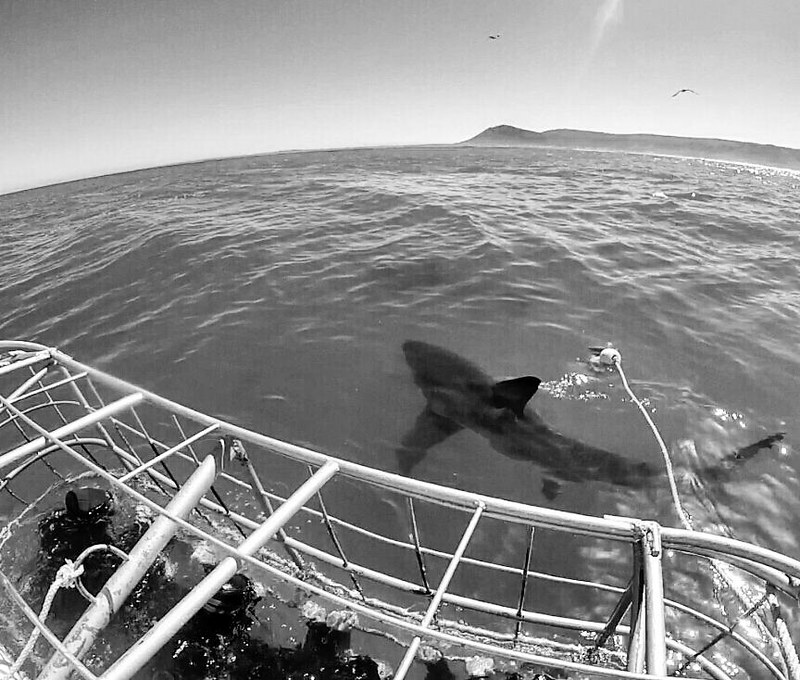 Some sharks would mindlessly chase after the bait, like a cat chasing a string. These guys seemed like the more inexperienced hunters. The bigger and wiser sharks; however, came up with a sneak attack method. I swear, I never even saw the shadow of this one shark in the water. Before I could even react fast enough with my camera, the shark had lept up into the air, exposing all its teeth and latched onto the tuna hunks! Yikes! Overall, I would highly recommend that everyone add this to their bucket list. It gave me a different perspective of this underwater creature, and a respect for their existence and way of life. Yeah, and sure we’ll put on our bucket list – as tentative…lol! 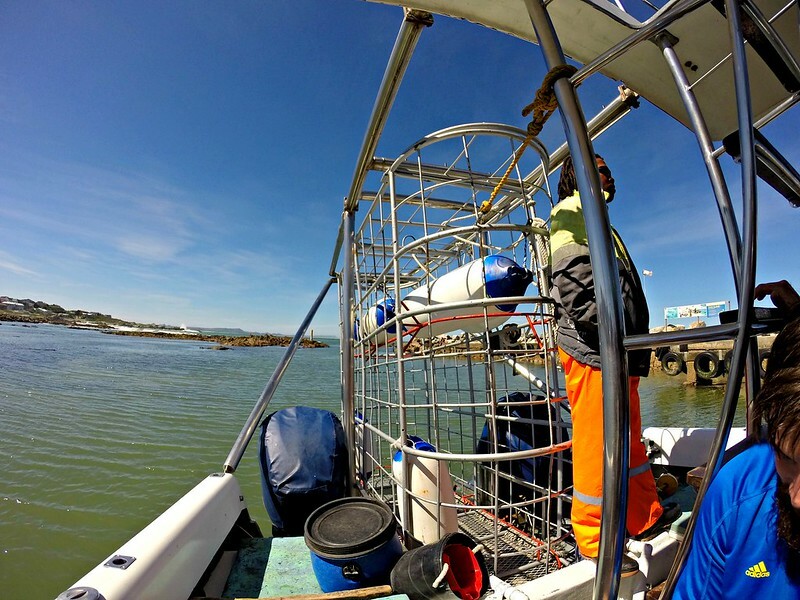 I hope it’s OK that I ask; Will you take a look at my post named “have you cage dived with great white sharks”, and then participate in the survey? If you haven’t already done so 🙂 Thanks for the follow, and have a great day! Great blog!!! Your photography is really awesome! I’ve done many of the things you have written about, and it was so much fun checking out your adventures! I’m not sure how many countries you’ve visited, but I just joined a club called the Travelers’ Century Club for those that have visited 100 or more countries 🙂 I am recovering from a bone marrow transplant, so my bucket list is something I take very seriously! It’s on my blog under Buttkick List, if you want to check it out and see some of the same adventures you have on yours 🙂 Keep it up!